The latest addition to our fantastic selection of bedroom furniture, The St Ives range will transform your bedroom, with its modern traditional styling, however can also be suited to any traditional decor. Its modern Dove Grey colour is finished with the finest Gold details, to give this range, and your room a classy finishing touch. This range has the quality to rival any other competitors, and is finished in astonishing Ash veneers to complete the modern, contemporary quality design. This St Ives wardrobe is a perfect addition to your home bedroom. With its modern traditional finish it will compliment any other furniture that you have. The 2 Door plus 1 drawer wardrobe features a genuine ash veneer top, and is finished with a contemporary Dove Grey paint, and Gold trimming that sets this item and range apart from any other. This wardrobe features a 2 plus 1 design, incorporating 2 doors and 1 drawer. This gives extra storage space for your bedroom, which will help tidy things up by giving you that extra place to store your items. The build quality of this item rivals more expensive alternatives, and is guaranteed to last you a long time. Overall this means that this item is incredible value for money, and is suitable for any home or decor. 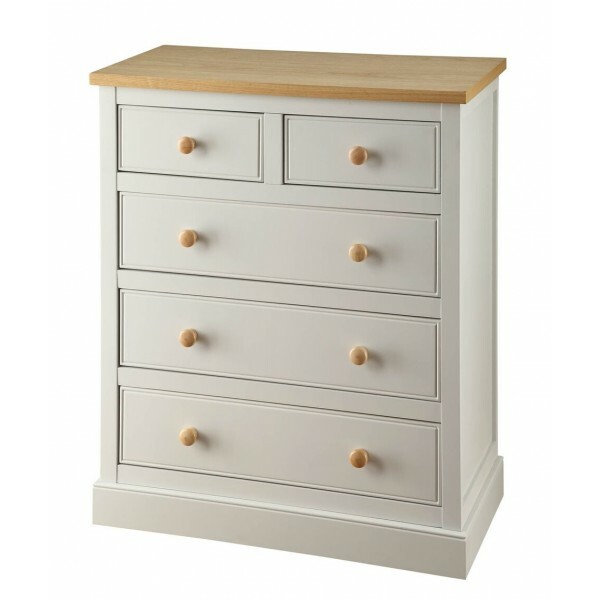 This 3 + 2 drawer dresser comes as part of the St Ives furniture collection, and utilities a 3 + 2 drawer design, incorporating three main and two smaller drawers. The St Ives 3 + 2 Drawer Dresser is perfect for any storage needs in the bedroom, also providing table top space to keep any other bedroom accessories together, and in their own space. This 6 drawer tall chest comes as a part of the St Ives furniture collection, this features 6 drawers as part of a tall chest, however does not take up too much room. Also this provides additional storage space for your bedroom storage needs. The dimensions for this tall chest of drawers allow it to fit in seamlessly with the St Ives 2 door 1 drawer wardrobe. We very much hope you’ll love these St Ive's range, please call our team on 0800 085 1422 or contact us if you would like to buy or have any questions. 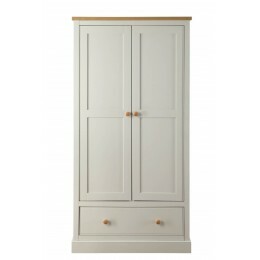 This St Ives wardrobe is a perfect addition to your home bedroom. With its modern traditional finish.. 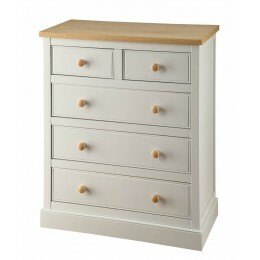 This 6 drawer tall chest comes as a part of the St Ives furniture collection, this features 6 drawer.. 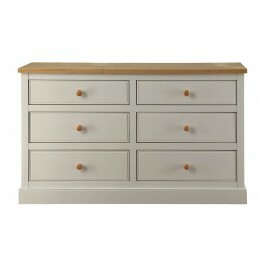 This 3 + 2 drawer dresser comes as part of the St Ives furniture collection, and utilities a 3 + 2 d.. 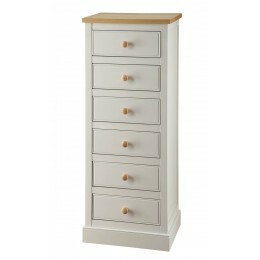 This 3+3 Bedroom Chest of Drawers comes as part of the St Ives furniture collection, and uses a wide..